The "Three Tenors of Frog Creek", evolved. 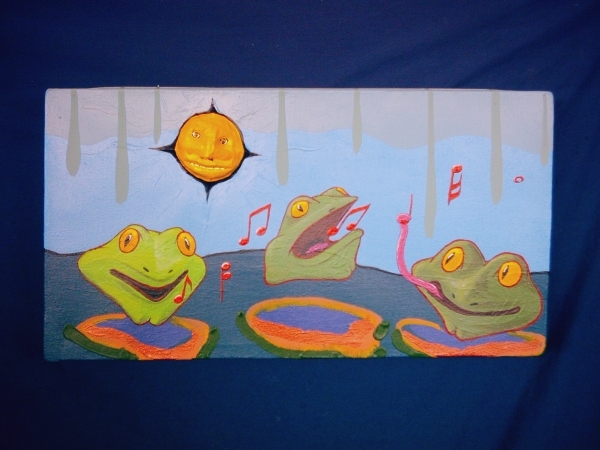 The initial incarnation for "Three Tenors"
In order to reinspire myself, I made extreme changes to the background and the frogs, so that I could see the piece anew. Modifying the sun in random ways kept the piece moving, even if it did not yet suggest a resolution. While listenening to several science podcasts in the last two weeks, I repeatedly heard about the recently described, extinct giant snake, Titanoboa (Wikipedia link); the largest snake ever. It was 50 feet long and over a ton in weight! This mindboggling constrictor lived about seven million years after the dinosaurs disappeared. 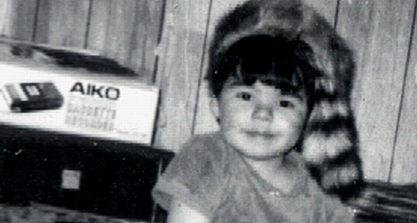 I imagine that it was a mammal eater and would have considered me a choice snack. Needless to say, it made an impression on me and changed the piece. I have been waiting a long time to excavate and reestablish the musical notes of the composition; added a few new ones. Added reticulation pattern to the snake's back. Three Tenors of Frog Creek and Sun-Snake, at Dusk. Only the turtle element survived the canvas "repurposing". This is how the piece looked, at the end of previous posting (Part 1 link, above). There was an existing horizon line, I decided to start adding some foreground. Now, I'm adding a volcanic icecap to the background, to create more space. I elongate the vertical perspective with intervening spaces. Adding sky, stretches the perspective range further into the background. Detail of the transmutating turtle/rattle. Find local Darwin Day events. Hello there! You have landed on the Bingorage Links Page (BLP)! Click the header image to be redirected to the main front page, browse links below for directory partners, check out sidebar for links to prominent Bingorage postings. Cheer. Native Online; great set of resources. Inuit and Native Art Bulletin. Clint's got the latest. Awesome drums! Young guy using traditional Northwest Coast motifs and contemporary subjects. of this traditional art form to collectors worldwide.